JMA reported that tremor was detected at Zaozan on 28 and 30 January, and minor inflation at the S part of the volcano was recorded. There were 12 volcanic earthquakes detected on 31 January. JMA raised the Alert level to 2 (on a 5-level scale), noting the increased potential for a small eruption. A seismic shock of M 4.7 occurred at 1758 on 1 September a few kilometers ESE of the summit. The shock was felt at JMA intensity IV near the volcano, and was weakly felt at Sendai (35 km E), Fukushima (45 km S), and Onahama (135 km E). Aftershocks were numerous, but declined toward mid-September. The high seismicity was the first at the volcano since July 1990, when there were many small earthquakes below the summit. Surveys of fumarolic areas on 5 September revealed no changes in temperature from the last survey in 1990. The Zaozan volcano group, the most active of northern Honshu, consists of a complex cluster of stratovolcanoes straddling the Pacific Ocean-Japan Sea divide. The Pleistocene Ryuzan volcano forms the western group (Nishi-Zao), and Byobu and Fubo volcanoes form the southern group (Minami-Zao). The complex was constructed over granitic basement rocks as high as 1500 m and thus has a relatively small volume. The 7 km3 Zaozan volcano proper forms the central group (Chuo-Zao), a complex topped by several lava domes and the Goshikidake tuff cone, aligned along a NW-SE trend. Several episodes of edifice collapse produced debris avalanches during the Pleistocene. 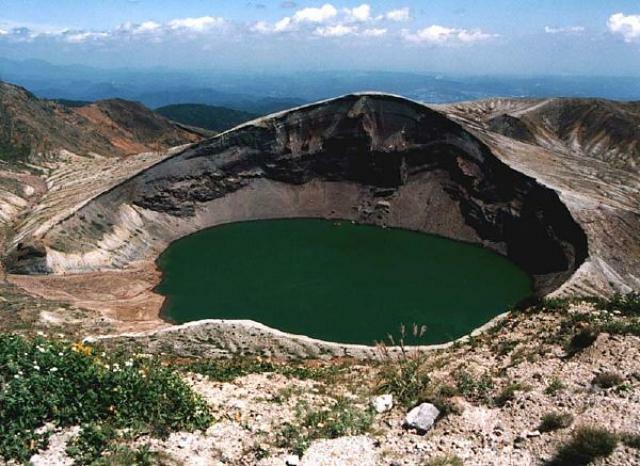 Goshikidake contains the active Okama crater, filled with a colorful, strongly acidic crater lake. It has been the source of most of the frequent historical eruptions, which date back to the 8th century CE. Hasenaka T, Ui T, Nakamura Y, Hayashi S, 1992. Traverse of Quaternary volcanoes in Japan. 29th Internatl Geol Cong, Kyoto, Field Trip A06, 74 p.
Ichimura T, 1951. 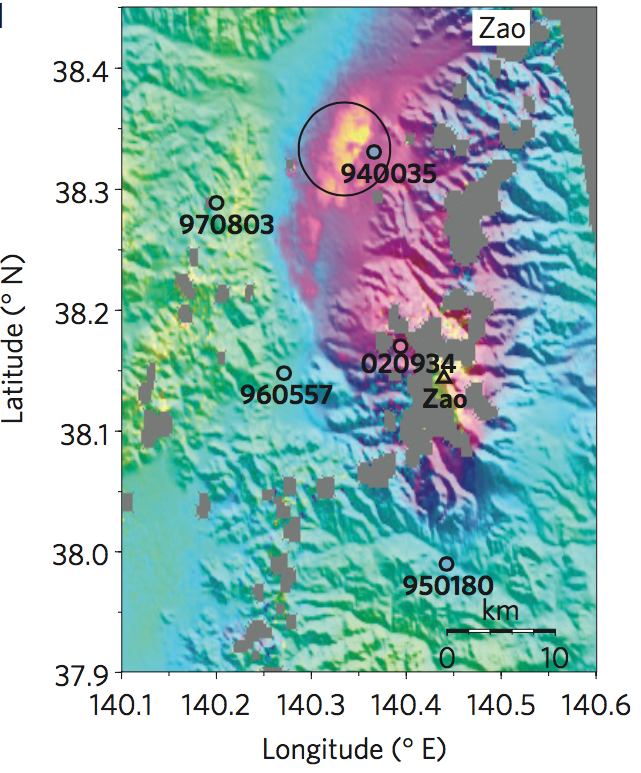 Geological investigations on the Zao volcanoes. 1. Goshikidake, a central cone of the Zao proper. Bull Earthq Res Inst, Univ Tokyo, 39: 327-339. Ishikawa H, Ohba T, Fujimaki H, 2007. Sr isotope diversity of hot spring and volcanic lake waters from Zao volcano, Japan. J. Volcanol. Geotherm. Res., 166: 7-16. Kudo T, Hoshizumi H, 2006-. Catalog of eruptive events within the last 10,000 years in Japan, database of Japanese active volcanoes. Geol Surv Japan, AIST, http://riodb02.ibase.aist.go.jp/db099/eruption/index.html. Miura K, Ban M, Yagi H, 2008. The tephra layers distributed around the eastern foot of the Zao volcano--ages and volumes of the Za-To 1 to 4 tephras. Bull Volc Soc Japan (Kazan), 53: 151-157. There is data available for 52 Holocene eruptive periods. 0884 (?) Unknown Confirmed 3 Historical Observations Okama, Z-To10 tephra? Close-up interferograms. Blue squares indicate geothermal power plants. GEONET stations are indicated by numbered circles, with the colour inside indicating the GPS displacements in the LOS direction. From: Takada and Fukushima 2013. Reference List: Takada and Fukushima 2013; Ozawa and Fujita 2013. Takada and Fukushima, 2013. Volcanic subsidence triggered by the 2011 Tohoku earthquake in Japan. Nature Geoscience, 6: 637-641. There is no Emissions History data available for Zaozan. Okama crater of Goryu-dake, the most well-known feature of the Zao volcanic complex, is seen from the east. The 360-m-wide lake is about 60 m deep. The volcanic lake has been the site of many historical eruptions. White mud deposited on the lake floor is periodically disturbed by gas emission, changing the color of the lake water. The Zao volcano group, the most active of northern Honshu, consists of a complex cluster of stratovolcanoes straddling the Pacific Ocean-Japan Sea divide. Copyrighted photo by Yoshihisa Kawanabe (Japanese Quaternary Volcanoes database, RIODB, http://riodb02.ibase.aist.go.jp/strata/VOL_JP/EN/index.htm and Geol Surv Japan, AIST, http://www.gsj.jp/). There are no samples for Zaozan in the Smithsonian's NMNH Department of Mineral Sciences Rock and Ore collection. Large Eruptions of Zaozan Information about large Quaternary eruptions (VEI >= 4) is cataloged in the Large Magnitude Explosive Volcanic Eruptions (LaMEVE) database of the Volcano Global Risk Identification and Analysis Project (VOGRIPA).